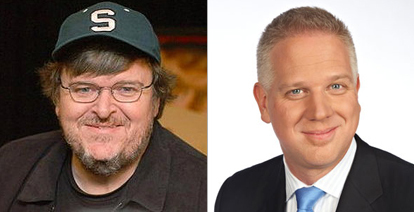 For your consideration, film maker Michael Moore on the left & media personality Glenn Beck on the right. As always. It is a very rare day when Glenn Beck and Michael Moore agree on anything. What do they agree on here? That Edward Snowden – the guy who leaked the information about the NSA court order to receive all of the Verizon “telephony metadata” – they agree he is a hero for defying orders of secrecy. This is the same guy that some people are urging should get the death penalty for releasing government secrets. For your consideration, President Obama on the left and Congressman Rand Paul on the right. As always. “I have no problem if you have probable cause and you target people who are terrorists and you go after them and people that they’re communicating with, you get another warrant. For your consideration, former Vice President Al Gore on the left and media personality Glenn Beck again on the right. As always … but here, they’re on the same side. We must NOT trade liberty for security any longer or we will lose both and deserve neither. For your consideration, Senators Jeff Merkley and Harry Reid. Both are Democrats. 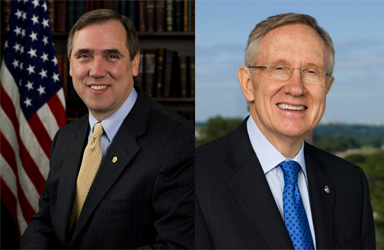 Merkley is on the left, but you’ll have to figure out who should be on the left & right here. This is one of those rare issues these days that is not about right or left. It’s about right and wrong. Obama and Reid are stating the government’s position clearly: the federal government thinks it should monitor EVERYONE. You know, because that way they just might find someone doing a bad thing. So let’s monitor EVERYONE. A part of this discussion, I believe, is that Verizon uses cellphone technology, which uses the “public airwaves” – Verizon is licensed to use a part of the electromagnetic spectrum, which belongs to the public. They are licensed to use this spectrum just as radio and TV stations are. I believe that’s why the government sought the “public” information broadcast over those airwaves in the Verizon court order. Public information, such as a picture taken of you when you are walking down a public sidewalk, is fair game. But private information, like who an innocent person is calling? That’s exactly what the government is gathering – that we know about. We don’t know what other data they are gathering. How much does this cost? Don’t know. How many terror plots has it already prevented? Don’t know. Is it constitutional? Don’t know. But do I like it? No. I cannot state that Snowden is a hero at this point. He took the law into his own hands, and revealed a secret program that a federal court had judged to be legal. It is not heroic to tell the government’s secrets — and the Supreme Court may still rule that the telephony metadata was appropriately obtained. We don’t know. Harry Reid’s comment is laughable, I think. We should tolerate the program because it’s old news? Riiiight. However, I don’t see that the program is outrageous, or obscenely outrageous. The government isn’t listening to the calls, and they’re not getting recordings of the calls. They are (apparently) just getting information about the calls. I don’t think it’s right. I think it’s wrong. The Guardian: Does The NSA Collect…. Posted June 11, 2013 by henrymowry in U. S. A.
I too consider much of the Patriot Act to be a wrong choice, but a wrong choice from a roster of all wrong choices.